Over the last few days Jenny and I have been demonstrating and running brief workshops at the Hay Festival in the shadows of the Black Mountains. This has been sponsored by Sky Arts in an endeavour to kickstart people’s creativity, and it has meant that we are reaching a different audience. What has been really exciting is the number of youngsters taking part and enjoying themselves. 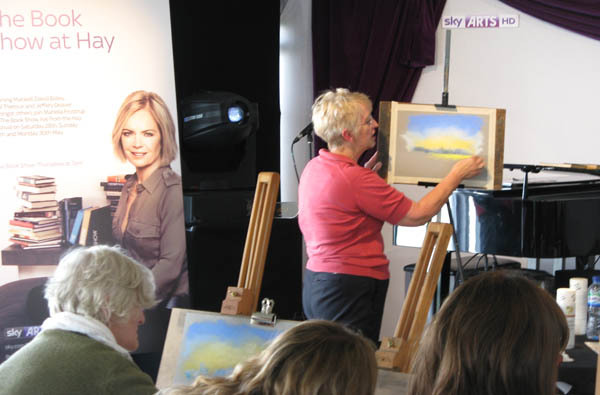 The picture shows Jenny demonstrating her pastel-painting techniques, and in the short time available she produced a lovely landscape. Pastel, though needs careful handling when you are not used to it: somehow one young lady managed to get more pastel on her face than on the paper! However, they did some really good work, especially as so many were absolute beginners, all benefitting from Jenny’s excellent teaching. I don’t normally do workshops, and to attempt to shoe-horn them into 45 minutes or so is tempting fate. At times things became almost riotous, but everyone put in a marvellous effort to produce a finished painting. Alas, the brushes for the workshop had disappeared overnight, so we had to scratch a few together, not quite having to resort to a stick of rhubarb! We are lucky in being sandwiched between two marvellous acts – Opera Playhouse with Pippa Longworth and Karl Daymond, and Hip-Hop Shakespeare. Pippa has a stunning voice and looks quite formidable clad in Viking gear, complete with horned helmet as she launches into a Wagner piece, while Hip-Hop Shakespeare is a marvellously original way of interesting young folk in the works of the great bard. Jenny and I will be there again on 30th May, 3rd and 4th June, and will be delighted to see any of you who can come along. This entry was posted in David Bellamy, Pastels watercolours demonstrations by David Bellamy. Bookmark the permalink.